TWICE THE BEAUTY. DOUBLE THE HOLDING POWER. CenterLock® features a patented mid-panel lock design that pulls panels tight to the wall and provides enhanced panel rigidity. 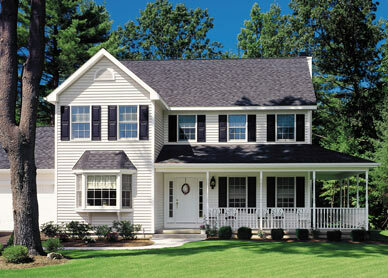 The unique lock design delivers twice the holding power of ordinary vinyl siding. And the extra-thick panels mean straighter, smoother, more even walls. In wind resistance tests, CenterLock siding stayed locked in place at wind forces exceeding 150 miles per hour. Choose CenterLock for an appearance just like wood siding, and greater resistance to extreme winds and weather, but without the headaches of regular maintenance.